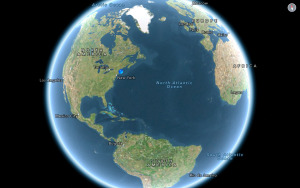 There are plenty of iPhone apps that improve or expand on the basic camera built into the iPhone and iPad. You can think of BlueStone Pond's SetMyCamMx 1.0.3, on the other hand, as a $4 app designed to replace the old-fashioned depth of field calculation wheels, which serious photographers sometimes threw into their camera bags back in the days before the Internet. You can use SetMyCamMx as an interactive tool for fine-tuning your exposure to ensure you’re choosing the right settings to capture your shot. 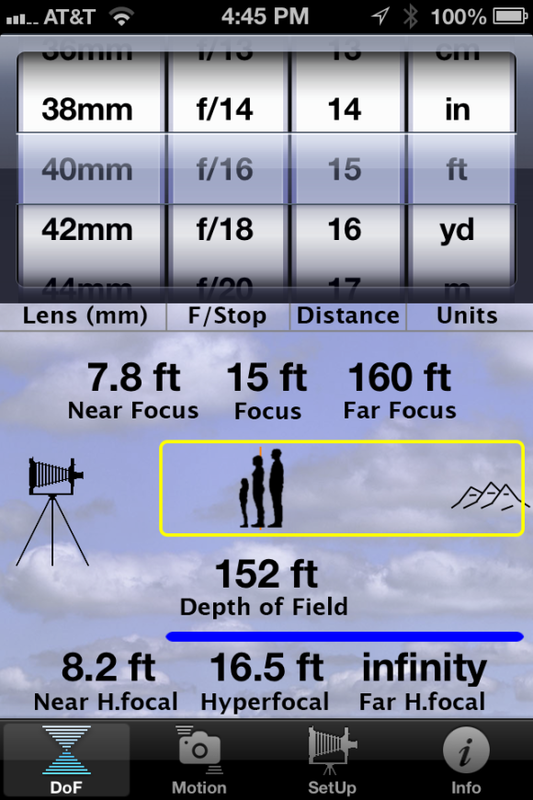 Dial in details like your camera lens and aperture, and SetMyCamMx shows your depth of field graphically. SetMyCamMx’s primary job is to help you figure out how to get the depth of field you need for a particular shot. Just dial in the focal length of your camera’s lens, an f/stop, and the distance to the subject—the focusing distance. SetMyCamMx will immediately tell you the closest and farthest distances at which the camera will be able to deliver an acceptably sharp focus. In other words, it tells you your depth of field. That makes SetMyCamMx a superb learning tool as well as a field guide. You already know that a larger f/number gives you a greater depth of field. But SetMyCamMx will tell you exact numbers: 50mm at f/5.66, focusing at 10 feet gives you 3.3 feet of depth of field. At f/32, the same lens and focusing distances delivers a huge 65 feet. Even better, SetMyCamMx shows you all this visually. Every calculation is accompanied by a graphical depiction of your camera, the subjects, and a yellow rectangle that represents the depth of field. You can get the same data from other depth of field calculators, but SetMyCamMx shows you the data in a way that leaves no room for confusion. That’s handy if you want to find the answer to settings questions like, “is my depth of field deep enough to include all the people in this scene, but not include pedestrians walking a few feet behind,” but often you are looking for something else: The hyperfocal distance. While it has an intimidating name, the hyperfocal distance is simply the distance at which you need to focus your lens to ensure that you get the maximum possible depth of field at any given f/stop. And SetMyCamMx tells you that at the bottom of the screen in plain English. Using a 50mm lens at f/5.6, for example, you should focus the lens (using the camera’s manual focus control) to 72 feet. If you do that, everything from 36 feet to infinity will be in focus. You’ll get better hyperfocal performance at f/22, though—if you focus the lens at 18 feet in front of you, everything from 9 feet to infinity will be in sharp focus. All of those settings depend upon your particular camera, of course, since depth of field is based on the relationship between the focal length of the lens and the size of the camera’s sensor, and sensors come in a variety of shapes and sizes. SetMyCamMx has a setup screen with a single menu for choosing your camera from a list of many dozens of models. You can choose your specific camera or select a similar one. Do you need a tripod? Hold your iPhone to see what shutter speed you'd need to overcome the jitters of holding the camera in your hands. 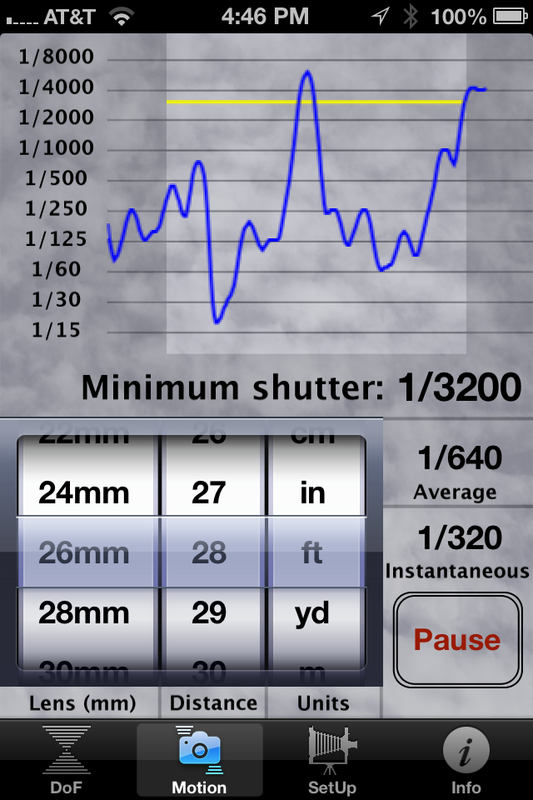 SetMyCamMx looks out for your shutter speed selection as well. You might know the rule of thumb that to get a sharp photo while handholding the camera, you should shoot a shutter speed that’s the inverse of the focal length. So if you’re using a 100mm lens, set the shutter speed no slower than 1/100 second. Using a 200mm lens? Don’t shoot any slower than 1/200 second unless you mount it on a tripod. This a handy rule of thumb, but it’s far from an exact formula. For a more accurate assessment, flip over to SetMyCamMx’s Motion screen. Here, SetMyCamMx suggests the minimum shutter speed you need to get a sharp photo based not on textbook assumptions, but by assessing how steady you’re actually holding your camera. Hold your iPhone against your camera as you hoist it up to your eye to frame the photo, and the app uses your phone’s accelerometer to measure camera shake and display the minimum shutter speed (along with a rolling graph of the instantaneous shutter speed you’d need to shoot at any given moment). Is it useful? It’s a great tool for teaching the value of high shutter speeds and tripods. And it’s fun to use a few times, to be sure. But for most photographers, this feature feels like a bit of a gimmick and probably won’t get used more than a handful of times. SetMyCamMx 1.0.3 isn’t for everyone. But if you’re a photo enthusiast looking for help improving your photography, then SetMyCamMx can supply you with all the depth of field and hyperfocal focusing information you’ll ever need, in an easy-to-read visual format. There are cheaper alternatives—like DOFMaster, to name one—but I really like the visual presentation in SetMyCamMx. I wouldn’t buy it specifically for the Motion feature, but it’s a cool extra in an app that does depth of field calculations just right.